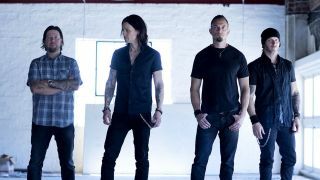 Alter Bridge will release a three-disc album of live and rare studio recordings on September 8, they’ve confirmed. Live At The O2 Arena + Rarities, to be launched via Napalm Records, is led with the band’s full 19-song performance at the London venue in November last year. Napalm say: “The latest release includes an exclusive full-length rarities CD sure to excite fans everywhere. The disc features the never-before-released tracks Cruel Sun and Solace, recorded during the One Day Remains sessions, as well as Breathe from the same time, which has only veen available as a US retail exclusive. Formats include 3CD, quadruple vinyl and a CD/DVD earbook including a documentary shot around the O2 Arena show. Alter Bridge’s current European tour includes an appearance at next weekend’s Download festival – details below, along with the album tracklist.